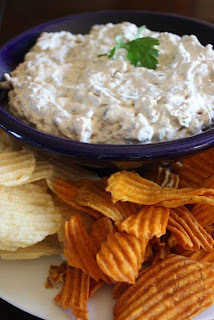 Have you made onion dip in the past with a container of sour cream and a packet of dried onion soup mix? 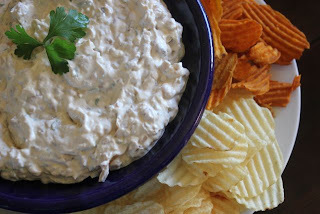 Same idea here, but much more decadent - can a dip be decadent? Well, this one is definitely delicious. And the smell of the onions caramelizing in your kitchen is divine (in my opinion). I prefer to serve the dip with sweet potato chips, but you could serve it with "regular" potato chips or fresh raw vegetables too. In a large skillet over medium heat, melt the butter. Add the onions and cook, stirring occasionally, until they reach a nice golden caramel color (about 25 minutes). Add 2 tablespoons of water and cook until the water has evaporated (about 3 minutes more). Allow the onions to cool for 10 to 15 minutes. Transfer the onions to a cutting board and coarsely chop. In a large bowl, mix the sour cream, cream cheese, parsley, onion powder, and Worcestershire sauce until smooth. Stir in the onions and season with salt and pepper. Taste and adjust seasonings if necessary (feel free to add salt & pepper or a bit more onion powder or Worcestershire sauce if desired). Serve at room temperature with chips. Enjoy!! 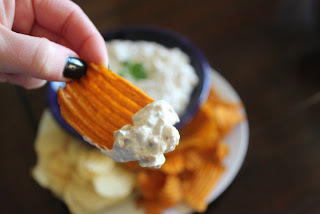 Note: If you serve the dip too cold, it will be too stiff and the chips won't hold up to dipping.